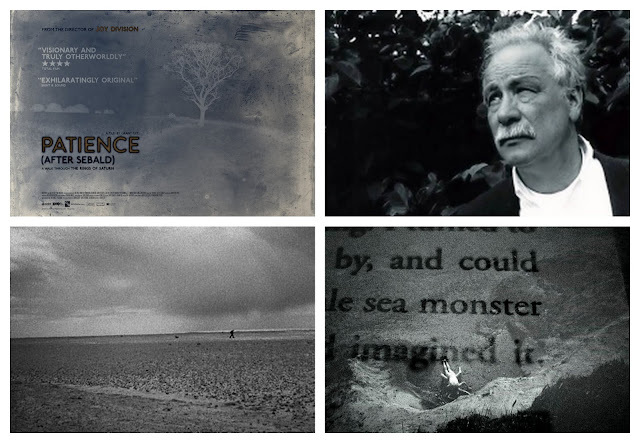 I’d looked forward for months to seeing the film, produced in conjuction with Artevents, whose work consistently excites me, and premiered at a weekend event in homage to Sebald back last summer. I enjoyed it very much; it’s lovely, but a frustrating hotchpotch: gorgeous, mostly black and white photography and a rich array of some of our most articulate writers and intellectuals: Andrew Motion, Adam Phillips, Robert MacFarlane, Tacita Dean, Marina Warner, Iain Sinclair and more, speaking eloquently about Sebald, The Rings of Saturn and their own engagement and fandom. The skeleton of the book is a hundred-mile walk in Suffolk, not far from Sebald’s home in rural Norfolk, both anchored in place and anything but anchored, taking off, like all his work, into the geography, history and memory of change, suffering and exile. The landscape, endlessly strange, specific and evocative, is wonderfully captured in in Grant Gee’s grainy black and white film with coloured insets and superimpositions. He walked with a heavy backpack full of equipment and shot it all himself and the result is both stark and subtle. The talking heads are skilfully woven into the flow of the landscape and this is visually beautiful and absorbing. But I found it, in the end, too rich an array of voices and views, so diffuse that it overrides the shape of the walking route, but doesn’t really carve a deeper shape. While I warmed to the modesty with which the film-maker, present at last night’s showing, described his lack of pre-planned structure, his surrender to content, contributors and serendipity, I wished he might have brought more of his own intellectual perspective to bear, as he did his consistently engaging aesthetic. Quite why Sebald inspires so many other artists and writers, quite what their heartfelt tributes add to his work or their own, I’m not sure. Still, I love that so many talented thinkers love his gentle, difficult books and find, as I do, a surprising refuge in his bleakness. It all takes place, and takes you to a place, radically far from any mainstream contemporary discourse. I’m tired and ill and scared, with a constant headache. After a couple of hours submerged in this, I came up cleansed and gentled, liberated from the headache into something more complex, less tight and egocentric, part of a many-levelled common heartache. More, uh, weird photos of the flooded bus lane here. This also appears on the Writing Our Way Home blog. The daily guest posts Fiona and Kaspa have been publishing this month for the new River of Stones include some really great and moving, useful stuff. It's a privilege and an ongoing small joy to be part of this movement. I could write a rather grim summary of 2011, of demanding, difficult, dragging months. But there’s another story, a story that’s also all mine, in the Small Stones I started writing for last January’s River of Stones, and kept up, to my surprise, on a new blog, for most of the ensuing year. 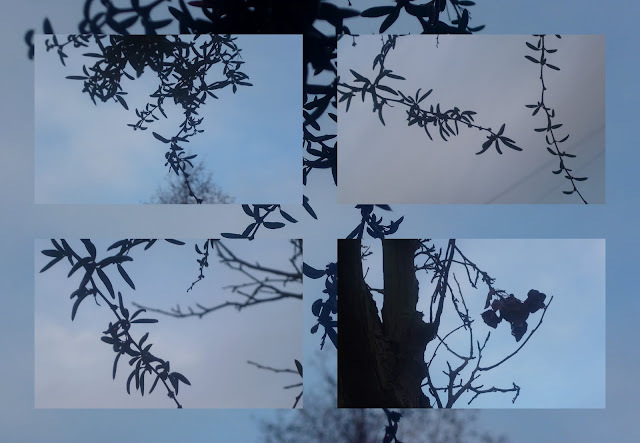 At 4 pm the daylight's almost gone - a layered, enclosing snail-shell of darkness. Just above our heads, the spreading trees hold up the heavy purple sky with their bare arms. There’s this crashing, storming, multifarious, chaotic, globalised, mediatised world that we find ourselves living in. Deafeningly loud interweaving stories shoot past our eyes and ears, an endless stream of the alternately tragic and trivial. No wonder we’re lured to take refuge in increasingly relentless hard work and routine or, when the energy for this fails, in numb insensibility. A mean wind slaps the house and whips a mass of dirty clouds across the sky. She steps fast. The white canvas bag on her shoulder billows, away from her body and back - a single wing. It’s been finding these other stories, which are also the stories of my life, our lives, that has saved me, I think, in recent years, in late middle age, from despair and decay and opened up an unexpected space for the creativity that, like so many people, I had not revisited since childhood. It began, perhaps, with learning to practice Buddhist meditation, which proved to be not – as it might at first appear - a turning inwards, but a quiet, persistent turning outwards from the rigid refusals I’d been practising since an unhappy childhood. A new, small but growing capacity to be in the moment and to trust that this moment, right here, was the only one I needed to confront – and I could. The grass is a pale-green sea of dewy sunshine. Near the horizon, a white streak of dog. The hazy almost-warmth of late afternoon: a dreamscape seen through a voile curtain. Or perhaps it began with blogging, with the impulse after reading other people for a few months to have a go myself at writing. This meant looking, noticing, noting what I saw. Looking led to buying a camera, and photographing what I saw led to seeing differently, seeing smaller details, to a fuller, but quieter view. Liquid light pours through a window, flickers like flames across cool shadow and the open, white pages of a book. A runner threads her way through the surge of shuffling commuters, lifts a foot and searches, vibrating with quiet energy, for a place to put it down. The man in the green dragon suit bends over, carefully packing his groceries into a big back-pack. His stiff, bright-green tail sticks straight up. Thus far I’d come by myself, and with much inspiration from other writers and bloggers, when I heard about the first River of Stones in January 2011. Convinced in theory of the need to be still, to look closely and to find our own words, I was too often crushed, by work, by information overload, by life in general, too often losing touch with what I knew and finding little space to try and get it back. So little space. But just one moment, one perception, one sentence a day: this surely even I could do? Rain on the train window turns the landscape into an unfurling pointilliste fresco. In the cafe window, a small old man with skin like a dark, bruised plum and greying, wispy corn-rows sits rocking and staring out. It has helped. It has fed into other small creative efforts. I’d like to think it has affected, just a little, the way I approach every day. I’m still doing it, on and off. I don’t know how long for, but every time I do, I’m glad. It’s a game, a trail. It changes, trying different forms, shorter and longer (but not too long, the longer ones, I see in retrospect, are the least focused and satisfying), winding sentences and tiny poems. Looking back across my own small river of ‘stones’, I’m immensely glad of this other, quieter story of the past year. blur of legs and spokes. I'm afraid this is one of those laboured links that radio presenters mock themselves for. The potted front-garden miniature olive tree: elegant and pleasing, a small source of cheer, and at the same time a small horror, so removed from its ancient home and function and meaning. It's a symbol of dislocation, travesty - the ground, the fruit, the process: gone, all gone! Somehow this resonated with the latest piece from Slavoj Zizek, in the new London Review of Books, which is all about things unbelievably gone, all gone.
" ...greater efficiency, raised productivity etc which produces unemployment, rendering more and more workers useless: what should be a blessing – less hard labour needed – becomes a curse. Or, to put it differently, the chance to be exploited in a long-term job is now experienced as a privilege". Not too long or difficult an article, it's worth reading in its entirety. Sometimes it's a relief to see the monstrous global situation articulated. The monstrousness absolves me - look, it's not just me, not just my personal dislocation and threatened implosion! Just as often, of course, I wish it was just me. Or (deeply sad as it makes me to contemplate its fate) just the olive tree. Not often I find myself at the top of the New Building. It’s all fancy, glass-walled meeting rooms overlooking the city roofscape. Since it's quiet up here this morning, I step outside, just for a moment, to admire the panorama from the balcony encircling the whole floor. A damp, but clearish day with wide views (and long drops - ouch, look out, not down!). After the briefest of strolls around I try the nearest door and find it locked. The next door and the next also resist my hand. The door I came out through is the only one left unlocked, then, in Winter - either that or… oh no, they’re all fixed to open from the inside only! On the long walk, heart in mouth, around the building back to where I started from, I’m oblivious to the 360-degree vistas, absorbed now by mental visions of miming my embarrassing plight through the glass wall to one VIP group or the other: locked out! let me in! The door I came out of opens, of course. How quickly the mind leaps to the worst-case scenario. the past or the unconscious. "Everything gets a bit foggy on the eve of a journey, even a journey so habitual that it ends in a workroom much like this one. You have to force yourself to be fully where you are until the last moment, not to succomb to the sensation of having already left before you’ve left. You work, you go out to buy something, you write for a while, lie down for a siesta and don’t manage to sleep, you repeat the gestures of every day, but there’s a twinge in the stomach, a kind of vertigo threaded through daily things, like that step you trip over as you fall asleep". Some very Buddhist words [my very quick translation] from Antonio Munoz Molina, about to fly from Madrid to New York, where he lives and works for part of each year. He captures the difficulty and necessity of staying 'fully where you are': if we aren’t present, we aren’t truly alive. Not that I’m physically taking off for anywhere, but there's a similar sensation when the mind is always on the next thing, the thing undone that should be done, when time rages and you're lost and at its mercy. "Everything gets foggy" – indeed. The small, stolen moments of observation for writing my ‘small stones’ are a breath of sanity and presence. So are the very precious moments of taking photographs. No time to describe what a scene like this, through a dirty pane of glass, made me feel. Scarcely time to feel it. But time, sometimes, to capture it visually. Reflection, illusion, but in the recent grey, windy, rainy weather, the 'real' city has been feeling rather like this - which is what sent me back to look at, and reinterpret, some photos from a while ago. Back to work today. I’m the only staff member in the office. While outside the wind and rain that crashed all night come slowly to a halt, in here the silence resounds. There is so much to do. Back for eleven weeks and then the decade or so spent working here will be over. This feels so strange. There’s something very liberating, of course, about a time of transition. But how do I generate the energy required to leave things here in reasonable order? How do I start to look forward – which I must – when the future isn’t here yet? I don’t know. How do I live well enough, productively enough, realistically, tolerably with this not knowing? How do I nurture the raw aliveness and curiosity I occasionally feel and minimise the lostness and numbness that threaten to overwhelm? How do I find words, when this weightless vacuum scarcely seems to support them? Coming back to what is right in front of me is always a good way. The River of Stones flows again this month. It’s a small and magical practice. Stop. Look. Here you are. Right here. Right now. What do you see? Pay attention. Write it down. I’m kind of amazed and very glad to still be doing this a year after the first attempts. Do have a go, if you haven't previously - or if you have!